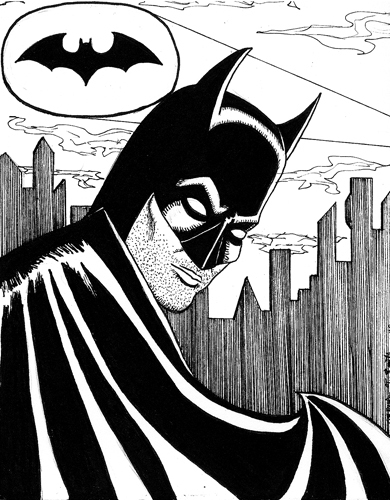 I'm pleased to announce that I'll be attending WonderCon 2011 in San Francisco April 1-3! 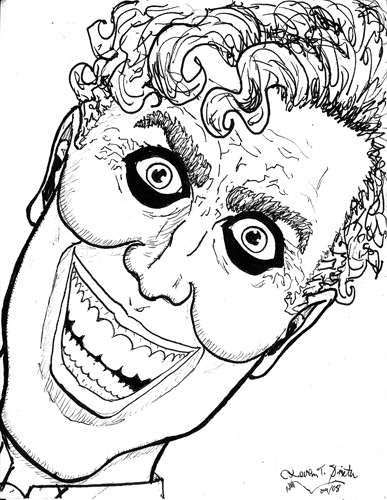 I'll be at Brian Andersen's CBG Comics table helping to promote the So Super Duper comicbook. I'll also be selling some of my artwork there. I'll be selling original art cards (each are unique and handmade!) and I'll hopefully have a handful of prints of the DC Heroines 2007 and 1 or 2 of the prints that are left of the DC Villainesses 2007 available for purchase. This is your chance to buy these pieces without having to pay for shipping! I hope to see you there. Once again, I am participating in the charity auction for Wonder Woman Day V, 2010. The auction will benefit Bradley Angle as well as other domestic violence programs. I continue to participate in this event because this cause is very important to me, and I hope you will consider bidding on my piece to help raise money for it. As per my usual M.O., I want to continue to depict an empowered Wonder Woman who takes joy in her life and what she does. I also wanted to do a follow up to my piece last year, which had She-Ra in it. As I noted last year, Wonder Woman and She-Ra seem to contain some analogues in their Rogues Gallery, and I couldn't resist taking a crack at another pairing. I also love to put out more images of Wonder Woman and She-Ra working together, as opposed to fighting each other. Right now, the Wonder Woman comic book is being written by J. Michael Straczynski, who also wrote many episodes of the She-Ra: Princess of Power cartoon series by Filmation, which is celebrating its 25th anniversary in 2010. I definitely wanted to do another piece with She-Ra to help contribute to the passing of that occasion. Wonder Woman's designed changed a little from last year's piece. I wanted to simplify her outfit just a tad to make her more similar to the level of She-Ra's design, so I opted to leave off the diagonal side seams on her boustier. I also went with a more Lynda Carter-esque design on the boots, as opposed to the early Terry Dodson "w" shaped top cut to the boots. In addition, I rounded the edges of her bracelets. She-Ra's bracelets were also smoothed a little on the cuffs, and I added the raised circlet on the center of her choker that the Masters of the Universe Classics She-Ra figure by Mattel had. Circe's design was a combination of the way she appeared as Terry Dodson drew her in the Heinberg-written issues of Wonder Woman, as well as the DC Direct action figure based on Dodson's designs. Shadow Weaver remained largely true to her Filmation depiction, but I wanted to "fancy" her up just a bit to bring her closer to the level of detail and design that the other characters in the piece had. I gave her a corset , still in red, but in a deeper red than her dress she wears, and gave it a shinier texture. 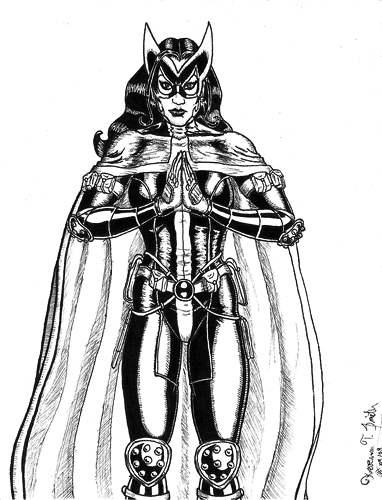 In some early artwork of Shadow Weaver, her belt was a gold or yellow, so I went with that interpretation of her belt and added a row of spikes to it as an homage to a custom Shadow Weaver figure that I own made by Scott Falappi. I also depicted her with the wand that she used in the second season She-Ra episode, "The Caregiver." Because Circe and Shadow Weaver are both very formidable and dark opponents in each of their respective franchises, I wanted to set the piece in a more dangerous setting, and Shadow Weaver's Horror Hall base, set on top of a volcano, was just the ticket. In preparing for this piece, I did a lot of research on Horror Hall and looked at shots of all the incredibly beautiful backgrounds used in the cartoon series. I also looked at different elements and creatures who were associated with Shadow Weaver in the series, such as her vulture, Syrax, her servants, her bird-like spy, and vermin that lived in the tunnels of Horror Hall. Ultimately, I didn't feel like they would contribute to the composition of the piece, and I wanted to refrain from doing "too much." 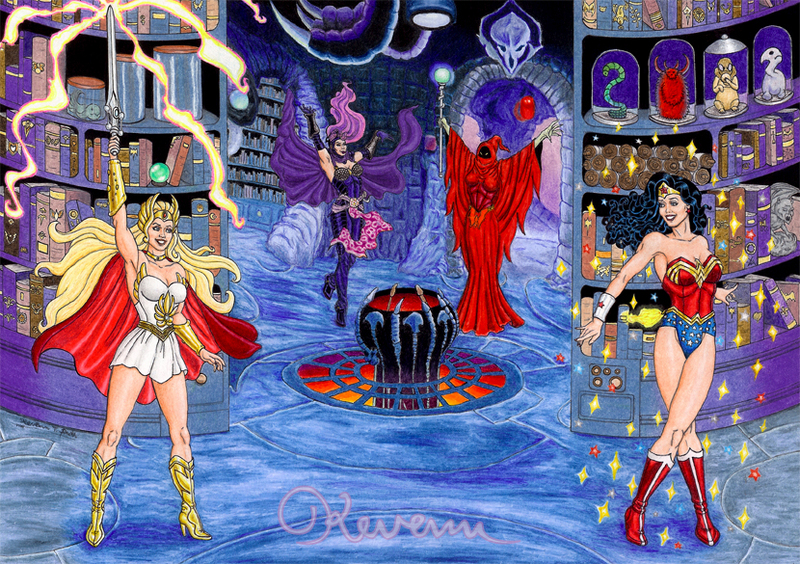 I opted to depict the main "hall" and what looks to be Shadow Weaver's library, which seemed to be used the most, while taking elements from the background paintings made for the series, as well as adding several "easter eggs" for fans of the Princess of Power show and original Mattel toyline. For sale as T-shirts, Skirts, Hoodies, Kids' & Babies' Clothes, Posters, Throw Pillows, Tote Bags, Studio Pouches, Mugs, Travel Mugs, Photographic Prints, Art Prints, Framed Prints, Canvas Prints, Metal Prints, Greeting Cards, Laptop Skins and more! Please use the "Contact Me" form at the top-left of this page to request and inquire about pricing and size options. 11.5 x 8 inches Bristol Board. 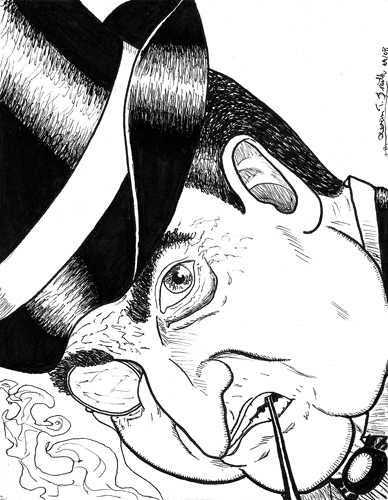 Pencil, ink, & Prismacolor pencil. Now available as a print from RedBubble.com! This piece, entitled "Wonder Clubbing," is one that I did for the silent auction for Wonder Woman Day III to benefit two domestic violence shelters and a women's crisis line. 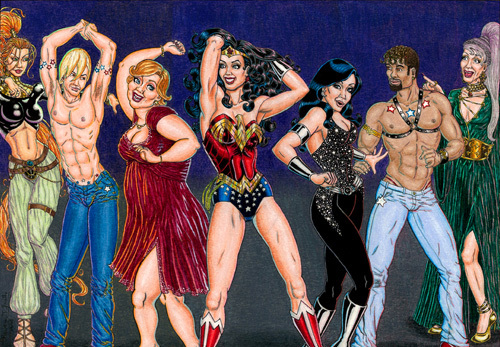 I wanted to do a piece that showed Wonder Woman and her closest friends having fun and enjoying themselves, so I depicted them dancing at a club with a couple of admirers. One of my goals for this piece was to also include characters close to the hearts of Wonder Woman comic book fans like Artemis, Etta Candy, Donna Troy, and in a way, Circe.